Maureen Lines is beginning to believe in miracles. Firstly, the funding in full by Neil Kreitman of the cost of building the second classroom in Birir; then a US$3,000 donation by Suzanne Kapoor for patients and finally Heather Madine donating £4,000 within 24 hours of our last newsletter going out from her late mother’s estate, to the flood appeal. The Howman Trust donated a further £2000. In general it is easier to raise funds for projects than for running the organisation, so anyone donating funds who say they are “for the flood appeal or any other use you may wish” are particularly popular!At this stage it is probably helpful if I explain the workings of accounts for a charity like HKCA which is strictly controlled by The Charities Commission. In the normal way funds that flow in go into the general fund to run the organisation and can be used for anything within the charities remit. However when a special appeal is made such as for the flood appeal and funds come in earmarked for ‘The Flood Appeal’ they have to go into a restricted fund for it and only be used for that objective. In this case the funds were raised before all the newsletters had been despatched so the Trustees of the Howman Trust were approached to see whether in the event of funds being raised exceeding the £6,000 target, their donation could be switched in part into the ‘Patients Fund’. This was readily agreed to as the patients fund was already used up and we were only half way through our financial year. A pathway along the river that has been washed away in the recent floods. In general it is easier to raise funds for projects than for running the organisation, so anyone donating funds who say they are “for the flood appeal or any other use you may wish” are particularly popular! In early September Maureen finally received her NOC (Non Objection Certificate) to allow her to travel back to Birir and stay there albeit for only 4 days a week. She writes “It was wonderful to at last be able to return to my adopted family in Birir………….. but perhaps, here, I should allow her to take up the story. When I was a child, my mother and her parents always told me that you did not ASK anyone to give you something. When I was a young teenager that was modified to it was okay to ask for things for the good of other people but not for oneself…. 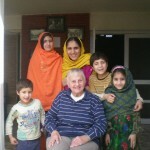 For over thirty years now, I have been asking for funds to help a small ethnic minority group here in North-West Pakistan. I am asking my trustees to include on our website and to publish here our record of projects, both by HKCA and my Pakistan NGO – KEPS (Kalash Environmental Protection Society). Why, you may ask. When I began ‘work’ in the Kalash valley of Birir, it was as a ‘ barefoot doctor’. I had been appalled at the people suffering due to lack of medical help. I had no vision, THEN, of extending my activities; but as I became more and more involved with the people in personal relationships, I knew I had to expand my work. I was aided and abetted by a very erudite Pakistani bureaucrat – Shakil Durrani. When finally I decided to form an NGO and then later had ideas of a British charity, I was told by well-meaning friends, that it would be a mere drop in the ocean and it would be very difficult, etc. etc. This is why I should like to include our list of projects since 2000 for all of you to see for yourselves what we have achieved with that drop in the ocean. Details of projects prior to 2000 can be seen on our website. Although I can only abbreviate in a few paragraphs what has happened to me the last two and a half years (to be included in a new book, already half written), it is important to give the background of my present situation vis a vis our work in the Kalash valleys. Due to a corrupt local administration and a deteriorating security situation on the Pakistan/Afghan border, for a year and a half I became a shuttlecock. The local administrators would get the police to throw me out and then the Provincial government would work to get me reinstated. During that time, tragedy struck part of my large extended family. 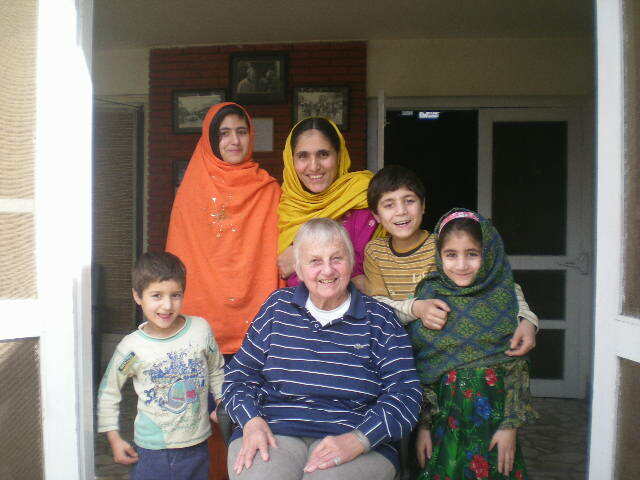 I and Gul Akthar, a woman who had looked after me and one of my dogs for twelve years, with her husband and four children moved into a separate house which we had built together. A few months later, the husband, who manned the small electrical power plant, was electrocuted. Even his funeral was interrupted by police sent by the local administration. Maureen with her adopted family. As many of you know, I then adopted the widow and her four kids and we have become a close knit family, BUT for over one year I was not allowed back in the valley of Birir. During this time I also had an unavoidable back operation. My family has come down during the winter months and quick visits in the spring. This now brings me up to the present day. Finally, the local administration was replaced. We now have a very erudite District Police Officer; and, according to the people, a ‘great’ Deputy Commissioner Officer, whom I have yet to meet. The army is now taking a lower profile and, with the hope that the militancy will take a back seat, I have now returned three times to Birir during the last two months. The last visit was for two weeks and we accomplished a great deal. I also have a sympathetic three man police security detail, who even chop wood for us! During my time there, many people came to visit. They told us how they had missed us and what good work we were doing for them, confirmed by the police who have been mixing with the people. This was made easy by their being in mufti. The DPO has served in Europe and understands the Western mindset besides having a realistic view of what is good security. 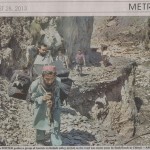 After the good response to our flood relief appeal, we are replacing broken water channels, water pipes and building retaining walls, besides which the school is now once again gathering momentum with the foundations of classroom two now complete, and we are bringing to Chitral and Peshawar more and more patients. Over the years, some of you have helped with vehicles. We are only a small charity and the only thing approaching a salary for me has been small gratuities for supervising projects. So, this is an issue which always needs your assistance. All our previous vehicles were well used and only two in the twenty two years I have been working on projects proved bad buys. The others have stood us in good stead, but the roads are appalling, and my jeep up in the valleys is breaking down and needs a new engine. Also, it is not registered to bring down country. My corolla here in Peshawar has been a great car, but it is now mostly in the workshop. 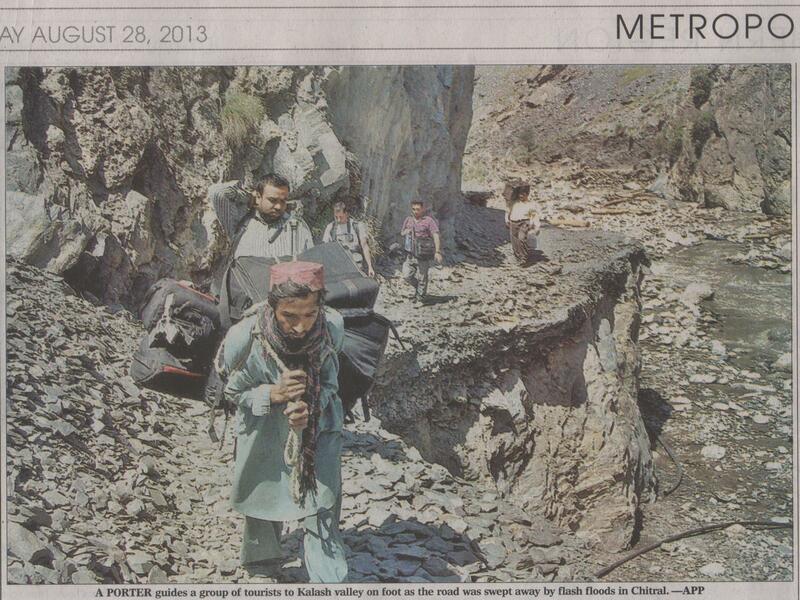 Out of my three trips to Dir, en route for Birir, this past two months, it broke down on two of them. My back and my drivers cannot compete with this difficulty. It takes us up to twelve hours to reach Birir from Peshawar – twelve hours on these awful roads (nine to ten hours if you have a good vehicle). So, yes, I am desperately seeking your help for funds to put towards a new vehicle, one which we can use for the entire journey. We used to stay in Dir, but that is no longer viable due to the security situation. I should also add that this is for patients as well. There is now only one flight a week between Peshawar and Chitral, at an exorbitant price – back in the ‘mists of time’ there were two flights a day. Public transport consists mainly of wagons with gas cylinders, which are always exploding. Sometimes, I have to send patients by public transport (a case of Hobson’s choice), but the more I can send by my vehicle, the better. A vehicle tough enough for our roads and in good condition are not cheap; our investigation of the market indicates a price of around £9000. So, if you can bear with me on this……I do not think my mother or grandparents would have objected.